Well, Sheriff Donna gave Sam and Dean a ring on Supernatural Season 11 Episode 7, and it was definitely the right call for taking on that vengeful ghost. And who else was creeped out by those masks on “Plush”? 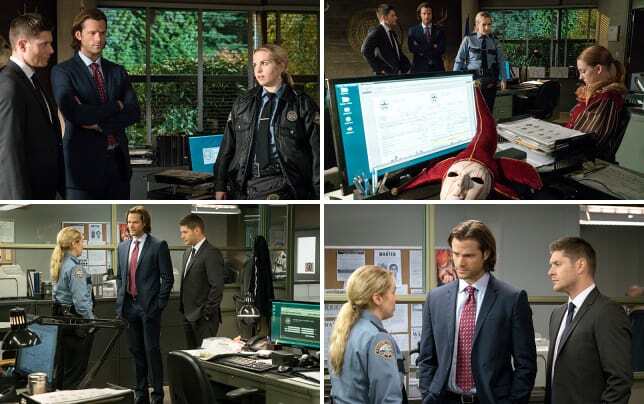 Join TV Fanatic staff writers Sean McKenna and Christine Laskodi and The Winchester Family Business’ Alice and Nightsky as they dive into the latest episode! Christine: The conversation between Sam and Dean in the car, when Sam tried to explain to Dean why he's praying. I'm really impressed that Sam is sticking to his change mantra. He's been completely open and honest with Dean this season — OK, not TOTALLY honest. He didn't tell him about the zombie monster infection. But aside from THAT... he's been honest — and I'm still baffled as to why Dean still has yet to really tell Sam about his connection to the Darkness. He's had every opportunity. Nightsky: Sam in the elevator summoning the courage to fight the clown. I thought that was hilarious! Jared has such great comedic expressions! Alice: I have a couple, but I’ll go with Sam and the clown in the elevator. It’s incredible how creepy that whole scene turned out when Sam’s clown phobia has been used in the past for comic relief. Not only is that clown mask completely creepy, but the clown enters the elevator with the elevator music in the background, bloody hand with scalpel, and calmly turns around after the elevator door closes to face Sam, who has a total internal freak out. Sam maintains his outside composure though and after a few seconds of pulling it together the confrontation may begin! It’s an awesome fight sequence considering it takes place in the confines of an elevator. I love the camera angles from the vent on top. Sean: Wow. Yeah, I loved that fight scene in the elevator, too. It was just a great combo of being super creepy, of Sam dealing with his phobia, and then getting that action scene. Definitely, nicely done. Did you enjoy the return of Sheriff Donna? Christine: I always love a good dose of Donna, dontcha know! I love that they keep bringing her back and that each time we see her, she's gained that much more confidence. I hope we keep seeing her. Though, I admit that I am a little disappointed to find that she and Jody aren't working together. Also, when Donna pulled the salt out of her fanny pack I'd hoped it would be more of a nod to Jody having taught her about monsters and not a diet joke. Having said that, I’m very disappointed with the way they tried to “develop” Donna’s character. She was defined by diet and weight references, boyfriend issues, and insecurities about being a female cop. That was all very trite and too superficial for an astute woman who has both a career and a handle on the unknown. Alice: Yes. I like her, and I was surprised that on Supernatural Season 10, she got to return after the lackluster Supernatural Season 9 Episode 13, “The Purge.” They gave her character a bit more depth in Supernatural Season 10 Episode 8, “Hibbing, 911.” I really wish they would stop with the weight talk and relationship issues though and let her be a little more badass in the hunting department. At least she’s fearless and has made a great impression on the boys. Sean: I’m relatively indifferent. She’s a little campy for me, but there was nothing over-the-top annoying from her during the episode. 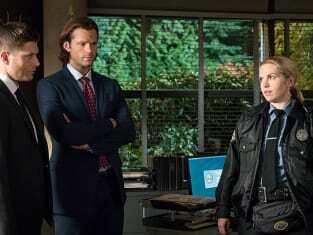 And while I think it was a little early to be giving her the hunter title, it was good to see Sam and Dean get involved in a case that brought back a familiar face. Which costume/mask of the episode was the scariest? Christine: Easily the clown. Like Sam, I'm petrified of clowns. They are no laughing matter for me. I had to look away because I was so scared! Nightsky: Luckily, I don’t have any phobias about clowns, jesters or animals so I wasn’t really scared by any of them, but I have to admit that I thoroughly enjoyed watching other people squirm through both Twitter replies and in my own living room! Alice: Oh, I’m going with that bunny. The deer head was a damn close second, but the eyes on that bunny the way it stared at everyone from all angles was just freaky. Kudos to the director, too, for playing up that chilling design. Sean: The clown mask for sure. That was supposed to be worn at kids’ parties? What a freaky mask that was even creepier by the way the person wearing it never spoke when they went and killed the coach or attacked Sam in the elevator. Nothing funny about that. Will Sam listen to Dean and forget about the cage? Christine: No way. He can't. The visions won't stop simply because Dean says to forget about it. Sam knows he's on to something, he just can't figure out what yet. I'm wondering if Sam will go to Cas or Crowley to talk about the visions, since Dean keeps shutting him down. Sam needs someone's insight into this, and if Dean is going to turn a blind eye to it, Sam has other options. Nightsky: Certainly not. How can Sam forget about the cage when someone is periscoping visions of it directly into his mind? No, when Sam gets a thought, he stubbornly follows it through to the end. He is already wondering if he “needs to go back,” so I’m afraid he’s going to hold onto that idea until he gets a definite answer one way or another. Alice: Yeah right. I’m stunned Dean would even suggest that. Has he not learned from the countless times Sam didn’t listen to him, especially just recently when he clearly forbid Sam from finding a way to remove the Mark of Cain and he did it anyway? Especially since Sam is feeling some horrible guilt over getting them in this whole Darkness mess? Sean: Oh that’s a good one, Alice! Dean’s definitely going to have a tough time stopping Sam, because like you all said, there’s no way Sam is just going to give up. He really wants to figure out the visions and what to do. I’m just as curious as to what they all mean, and I wish Dean would find a better way to work with his brother to find a safer alternative to getting some answers. Here comes some trouble!